Frankfurt - A goal from Mario Mandzukic was enough to earn FC Bayern Munich a 1-0 win at Eintracht Frankfurt and maintain their perfect start to the season. Mandzukic struck after just 13 minutes to ensure the same result as when the sides met last April, the day Bayern clinched the title. From one incursion, Alaba sent in a cross which Toni Kroos headed against the outside of the post from 15 yards. 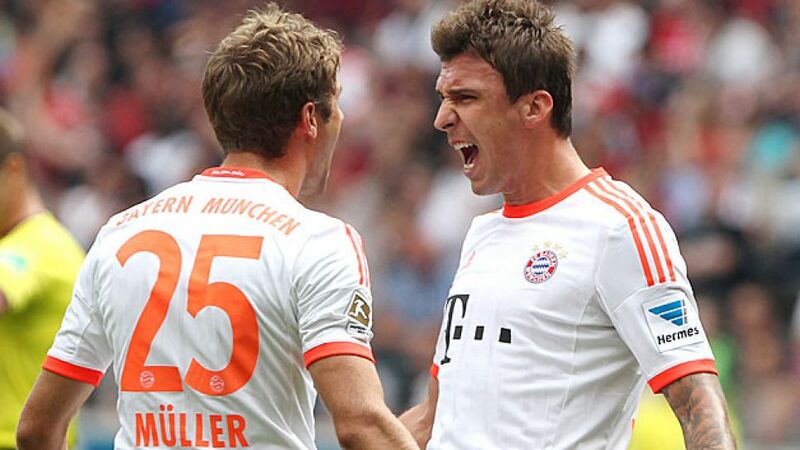 Not long after, Thomas Müller delivered the decisive ball from the right for Mandzukic, whose side-foot volley from six yards out opened the scoring. Bayern continued to force Frankfurt back, holding onto possession for what seemed like an eternity. Dante almost added to the scoreline in the 33rd minute, only for Kevin Trapp to make a fine reflex save to keep out the Brazilian's six-yard effort. Faced with such possession, Frankfurt knew they had to make every minor chance count and they tried to do just that before the break when Inui was sent clear by Alexander Meier, only to be crowded out in front of goal. The danger was not over, however, as Inui’s corner was headed towards goal by Johannes Flum and Meier touched the ball over the line, but the linesman’s flag brought the home team’s celebrations to a swift end. At the other end of the field, a fine last-gasp tackle from Bastian Oczipka denied Müller the chance to make it two before half time. Frankfurt appeared to get to grips with Bayern’s style a little better in the second half and enjoyed large spells of pressure of their own. Guardiola’s response was to send Thiago Alcantara on for Bastian Schweinsteiger, while Frankfurt coach Armin Veh had a reply of his own with Jan Rosenthal replacing Sebastian Rode in a more attack-minded system. Frankfurt were unable to find a way through and instead it was Bayern substitute Arjen Robben who found the back of the net, only to be denied by the linesman's flag. The Dutchman then had a direct free-kick saved by Trapp, before Eintracht's kitchen sink treatment saw Bayern come desperately close to squandering all three points.